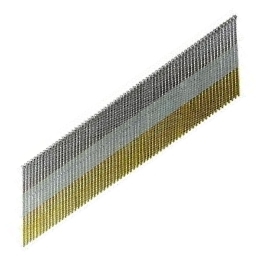 PRODUCT: 2-1/2" x 15 Gauge 304 Stainless Steel Finish Nails/ Brads, Senco Type "DA" Series, Angle-Collated Finish Nails. 8000/CASE. Price/CASE). APPLICATIONS: Larger Baseboard, Crown Moldings, Fascia, Fine Furniture, Face-frame, Finish Nailing.